Diese Zeitschrift erscheint zehnmal jährlich in Toronto, Canada. Sie präsentiert Qualitätsjournalismus in erfrischend klassischem Layout, und überall, wo noch ein wenig Platz ist, finden sich kleine Zeichnungen und Cartoons. Auf der letzten Seite jeder Ausgabe entführt ein Zeichner in ein Paralleluniversum. Bisher erschienen sind Bildergeschichten von Gary Panther, David Sandlin und Ron Régé Jr. - und im Juni von Markus Huber. 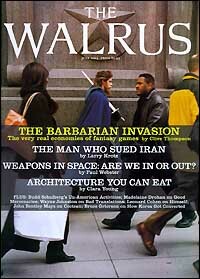 The Walrus Magazine is published ten times a year in Toronto, Canada. It presents quality journalism with a refreshingly classic layout. Wherever there is space, you'll find little illustrations and cartoons. The last page of every issue is given to a comix artist who introduces a parallel universe. Recently the page was drawn by Gary Panther, David Sandlin and Ron Régé Jr.. In June it was Markus Huber's turn who takes you to a literalist's world, where every word is taken at face value. Das Bremer Fanzine Panel erscheint seit 1989 und ist in den letzten Jahren mit einigen Preisen bedacht worden, darunter der „Prix Alph'Art" des Festivals von Angoulême 1999 als bestes europäisches Fanzine. Markus Huber ist seit langer Zeit zum erstenmal wieder vertreten, mit einem Zweiseiter "Diamonds (Are a Girl's best Friend)". Panel is a fanzine from Bremen, Germany, which started in 1989 and has since been awarded with a couple of prizes like the „Prix Alph'Art" of the Festival of Angoulême for the best European fanzine in 1999. This issue features a two pager "Diamonds (Are a Girl's best Friend)" by Markus Huber. Zum Thema "Superhelden / Science Fiction" verströmen sich unter anderen: Marcus Schäfer, Klaus Cornfield, Dice, Markus Huber, Calle Claus, Jule K., Ulf Harten, DM Trocken, Isabel Kreitz und natürlich Wittek, der das ganze betreut und herausgegeben hat. Lots of german comic strip artists, mostly of the fun/underground kind, revisit the superheroe/science fiction genre. Entertaining to see how many of them manage to avoid the genre's cliches and do the kind of comix they'd be doing anyway. Markus Huber's contribution is a one pager titled "Gemini". From other places you'll find works by James Kochalka, Jay Stevens, Mike Diana, Benoît Pourreau and others. Diese Strapazin-Nummer steht unter dem Motto "Wut und Tradition: Politische Comics". Der Beitrag von Markus Huber entstand nach einem Szenario von Frédéric Debomy. "Land der Tausend Pagoden" erzählt auf acht schwarzweissen Seiten die Geschichte einer Urlaubsreise nach Burma. In diesem schönen Land trügt der Schein: der Ausbau der touristischen Infrastruktur wird zu einem grossen Teil durch Zwangsarbeit der örtlichen Bevölkerung vorangetrieben. Und wo man Platz für ein Hotel-Resort braucht, siedelt man über Nacht zwangsweise eine ganze Stadt um. Die Geschichte entstand ursprünglich für ein französisches Menschenrechte- Projekt, das sich mit der Situation in Burma beschäftigt, einer der finstersten Militärdiktaturen des Planeten. Das Buch "Birmanie - La Peur est une Habitude" enthält zur Hälfte Comix, u.a. von José Muñoz, zur anderen Hälfte Augenzeugenberichte und Hintergrundartikel. Siehe unten. Strapazin #73 features political comic strips. For this issue Markus Huber worked with Frédéric Debomy, a writer from Paris. Their contribution "Land of One Tousand Pagodas" is an eight pages black and white story about a holiday trip to Birma. Originally they made the story for "Birmanie - La Peur est une Habitude", a book published by a french human rights project. See below. Ce livre a pour objectif de porter à la connaissance d'un public élargi la situation méconnue de la Birmanie contemporaine - un pays qui subit le joug de l'une des pires dictatures de la planète. En une approche inédite sont ainsi convoqués, d'une part, témoignages émanent de victimes de la junte militaire, de démocrates birmans et de représentants d'O.N.G., d'autre part des bandes dessinées d'auteur. Témoignages de Bo Kyi, Irma, Jamila, Ka Hsaw Wa, Maung Hla, Zaw Myint. Bandes desinées de Olivier Bramanti, Frédéric Debomy, Markus Huber, Olivier Marbœf, José Muñoz, Sera et Sylvain Victor. Birma - The Pain is a Habit. This book was made to introduce a broader public to the situation in contemporary Birma / Myanmar - a land suffering under one of the worst dictatorships of the planet. It contains testimonies of victims of the military junta, of birmanese democrats and of representatives of N.G.O.s and comic strips by different artitsts. The book is in french. Markus Huber's contribution is an 8 pages b/w story "Le Pays aux Mille Pagodes". The story was written by Frédéric Debomy. You find a german version "Land der Tausend Pagoden" in Strapazin #73.